August 9, 2014 | by Darcy Blake | The day at Partners in Parkinson’s, one of 11 events across the country, provided new tools and resources to help people with Parkinson’s Disease (PD) optimize their care. Attendees learned about the latest medical strategies in clinical development and they heard some insightful testimony from patients with PD. The event including breakfast and lunch was free, thanks to host Michael J. Fox Foundation, and national presenting partners, The Davis Phinney Foundation, and Parkinson’s Action Network. After a welcome and Introduction by Sohini Chowdhury, Senior Vice President, Research Partnerships, The Michael J. Fox Foundation, the morning started out with a session titled The Many Faces of Parkinson’s Disease moderated by Dave Iverson, who is traveling the country as the moderator with Partners in Parkinson’s. In the first session, he interviewed three people who have Parkinson’s Disease (PD). The panelists included Evan Henry, and George L. Johnston, and me. We explored the effects of the disease, how we dealt with it, and what we’d pass on to others. Exercise, self-confidence, and a positive attitude were mentioned as important factors in addition to our treatments such as Deep Brain Stimulation and medication. The second breakout Seeing a Movement Disorder Specialist was a peek at what an office visit is like. The doctor was Kathleen Poston, MD, MS, Assistant Professor of Neurology, Stanford University and the pretend patients were Robin and John Katsaros. What a long and thorough visit they had with her! The third session Parkinson’s Research: The Road Ahead included Jennifer A. Johnston, PhD and Co-Founder and CSO at An2H Discovery, Caroline M. Tanner, MD, PhD, Director, Parkinson’s Disease Research, Education and Clinical Center, amongst other titles, and Brian Fiske, PhD, Vice President, Research Programs, The Michael J. Fox Foundation. The team discussed on-going research to target proteins, including alpha-synuclein and LRRK2 that Dr. Johnston explained, “go hand-in-hand with developing biomarkers [disease indicators].” The PD research community needs biomarkers to help speed diagnosis and drug development. Dr. Tanner praised the Parkinson Progression Markers Initative (PPMI) volunteers, who have agreed to be a part of an observational study for up to five years, giving blood, spinal fluid, and data to find biomarkers that are critical missing links in the search for better PD treatments. The preliminary research from PPMI will make the discovery of biomarkers more promising. The group talked about the progress of the alpha-synuclein vaccine, which is entering the first human trial as a PD disease vaccine. Called PD01A, the vaccine targets the protein alpha-synuclein that experts think may be a cause in the onset and development of the disease. The Phase I trial is being conducted by AFFiRiS, an Austrian pharmaceutical company. Dr. Johnston compared alpha-synuclein to waste that can’t “go through the garbage disposal,” referring to the build-up of unwanted Lewy bodies, unusual deposits or clumps of the alpha-synuclein, along with other proteins, which are seen upon microscopic examination of the brain. 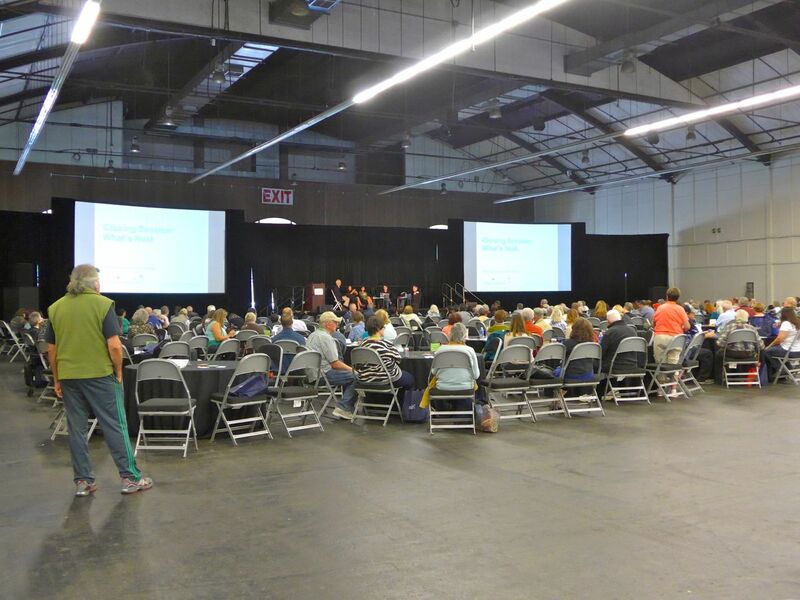 After lunch, there were breakout sessions on Living Well with Parkinson’s, focusing on exercise and nutrition moderated by the Davis Phinney Foundation, Building Connections, moderated by Sohini Chowdhury at MJFF, and I’m Still Wondering About… The event also included a resource fair. There were more insights, and much more information. The Parkinson’s Women Support was there in an outstanding turnout. We exchanged lots of emails with people we met, and anticipate some new faces at our lunches. Clearly, this is a great traveling event, and it was day well spent.